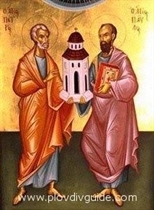 June 29th the Orthodox Church celebrates the day of the two apostles - Peter and Paul: Petrovden and Pavlovden. St.Peters Jewish name was actually Simon; the name Peter (meaning rock) was actually given to him by Jesus himself. Peter used to be Jesus favourite diciple - he used to call him the shepherd of the herd. When Jesus was led to be trialled, it was only Peter and one more diciple that followed him. In the courtyard of the high priest Caiaphas, the frightened Peter denied knowing Jesus three consecutive times... When he heard the crock crowing, Peter remembered what the Savior had prophecied: Before the crock crows, you will deny me three times, and he went away weeping bitterly... (Mt.26:58, 69-75). After the ressurrection, Jesus appeared to Peter first , to resume his apostleship. On that day, everyone named Peter, Penka, Kamen, Pencho, Peyo, Pesho, Petrana; Pavel, Pavlina, Polya, are having their name day.